Can Uptown development boom unlock potential of key Clifton Heights site? CINCINNATI -- A long-dormant development site could see new life in Clifton Heights next year, fourteen years after a McDonald's restaurant was demolished to make way for its redevelopment. The Clifton Heights Community Urban Redevelopment Corp., or CHCURC, is working with a pair of real estate developers on a mixed-use project in the block south of Crossroads Uptown in the old St. George Church. "We hope to start conversations with the community in the first quarter of 2019. It's very imminent," said CHCURC executive director Matt Bourgeois. 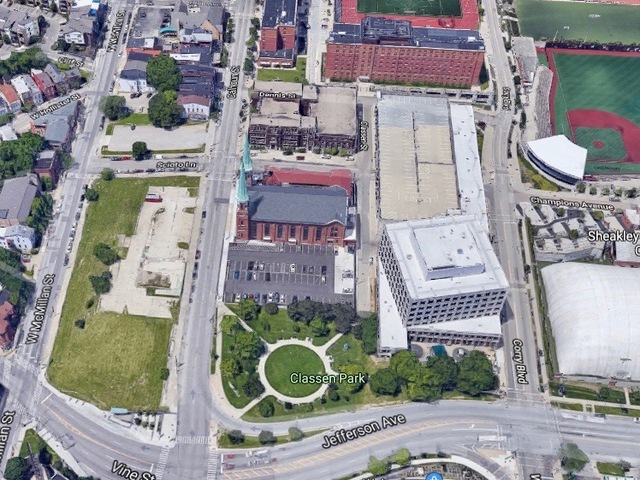 Bourgeois wouldn't name the developers or provide much detail about their plans, but he did say it would be "a project of scale" that will offer "tremendous views" of the city and cover the entire block between Vine Street, Calhoun, Scioto and McMillan. He said the project might include a hotel but definitely will not include student housing. "The private market is taking care of student housing," he said. "We want to be able to affect the edges of development and do things that maybe the private market isn't as comfortable with yet." Because of its prominent location at the top of the Vine Street hill and at the nexus of Clifton Heights, Corryville and Mt. Auburn, the site has the potential to attract visitors from the University of Cincinnati and several hospital and research centers within a mile of the site. The Uptown neighborhoods surrounding UC are in the middle of a development boom: More than $1 billion in hospital, research and student housing projects have been built or announced since the 2008 recession. CHCURC has pursued several ideas for what it calls Block 1 over the years, including entertainment attractions like ESPN Zone or House of Blues as well as various hotel, office and retail concepts. A $75 million hotel project was pitched for the site in 2015, but that deal expired in 2017, leading to a new request for proposals on the site this year. "It clearly is a site that wants to be developed," said Towne Properties principal Arn Bortz. "What we designed for the site five ago was primarily office with several decks of parking spilling down the hillside. The building had floor plates of about 22,000-square-foot per floor. But as with all projects like this you needed an anchor tenant."